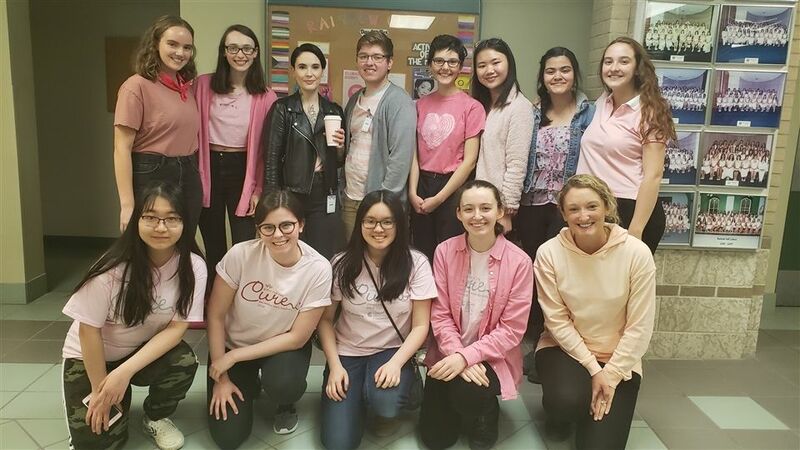 On April 10, 2019, Balmoral Hall School was filled with people wearing pink shirts to celebrate International Day of Pink! This day, which is all about fighting to end homophobia, transphobia, transmisogyny, and all forms of bullying, is an important initiative that allows students and staff to learn about and discuss these various issues. This year, Rainbow Club invited two speakers, Marcus Matheson and Hailey Primrose, to address Middle and Senior School students. Marcus, who spoke to grades 6 and 7 students, shared his experiences as a trans man and how those experiences have influenced his life. He touched on the importance of feeling comfortable in your own skin and how sometimes this can be difficult in the society we live in. Students were able to ask Marcus many questions at the end of his presentation, which made for a great conversation about finding one's own identity and supporting those around you. In the Senior School and Grade 8 presentation, Hailey spoke about her own personal journey being both Métis and a part of the LGBTQ+ community. She emphasized the power of self-confidence but also touched on how insecurities will arise at various points in one's life. It was interesting to hear about her perspective on the transition between adolescence and adulthood as well as how her own experiences have influenced the person she is today. It was extremely inspiring to hear from both of these incredible individuals on International Day of Pink 2019. The themes of both presentations were a great reminder that fighting to end homophobia, transphobia, transmisogyny, and all forms of bullying should be something we strive to do every day!